Spanning the whole northwest corner of Africa, Morocco is huge. 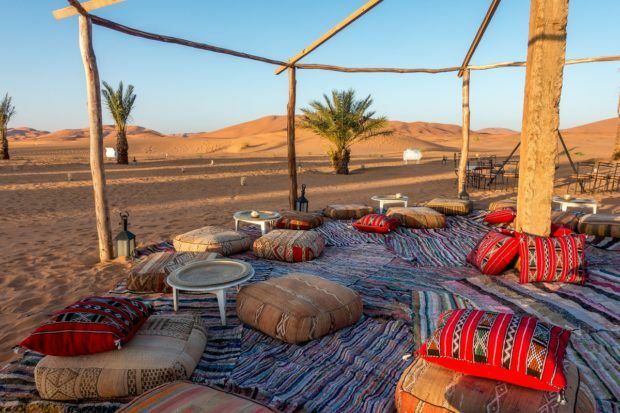 Across its landscape of mountains, desert, lush plains, and unique cities, the choices for the best places to visit in Morocco are hard to narrow down. But unless you have endless vacation time, you have to. That’s where planning comes in. 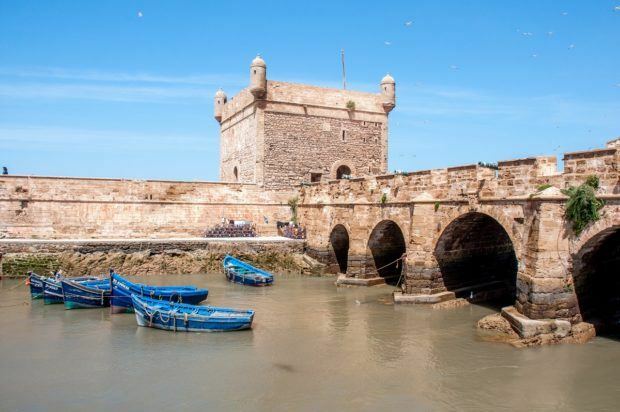 With some research and choosing the right route, it is possible to see a lot of the country on a two week Morocco itinerary. Our Morocco trip was just 14 days—12 days of actual sightseeing plus a day on either end for transit. In those days, we covered a lot of ground, driving from the Atlantic coast of Casablanca east all the way to the desert where we could see Algeria in the distance. We had some days with short trips and other days with much longer journeys, but all the destinations were worth the effort and the planning. In just 2 weeks in Morocco, we saw the major highlights and a few less visited places. Even if you have only have 10 days in Morocco, it’s possible to see a lot of what this beautiful country has to offer and to learn about its history, customs, and unique features. 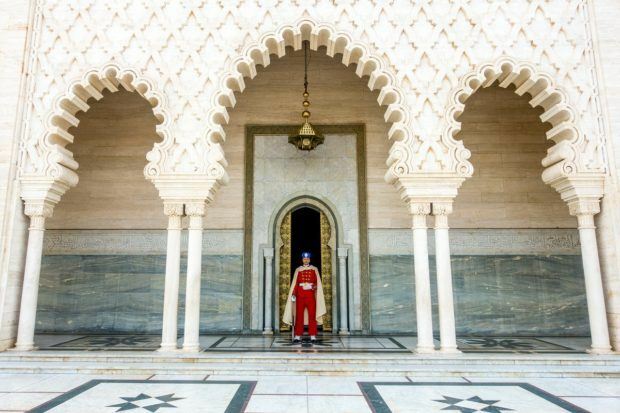 Most people arriving in Morocco from the US will start out in Casablanca, which has the country’s largest airport, or Marrakesh, because it’s awesome. Our starting point was Casablanca because we chose to visit the north of the country first before visiting the desert and then heading south. Casablanca is the center of business in Morocco and isn’t teeming with tourist attractions, which was fine with us because we were itching to get going to other places in Morocco. But we couldn’t leave without seeing the city’s main attraction—Hassan II Mosque. 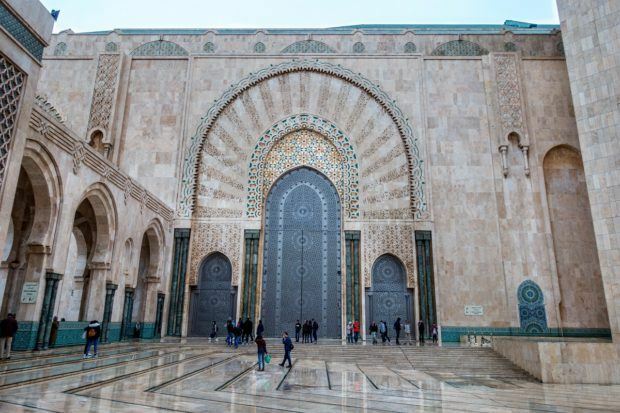 Although there are mosques all over Morocco, stopping at Hassan II is a must if you want to see inside one because it’s the only mosque in the country open to non-Muslims. The fifth largest mosque in the world, it was built in 1993 on land that used to be part of the Atlantic Ocean. The grand green exterior of the mosque and its massive minaret are instantly impressive. Inside, the handmade scalloped arches, crafted marble walls, and brilliantly carved wooden ceilings are gorgeous. The cavernous building is meant to hold 25,000 worshipers inside and 80,000 outside, so its biggest feature is space. There are a lot of details to see, and visitors need a guided tour. About an hour up the coast from Casablanca, we arrived in Rabat, the capital of Morocco. We made a beeline to the Kasbah des Oudaias, a fortified portion of the old city that dates from the 12th century and sits on a bluff overlooking the ocean. The narrow, whitewashed lanes of the kasbah are full of homes with brightly-colored doors that echo the blues of Chefchaouen on a much smaller scale. 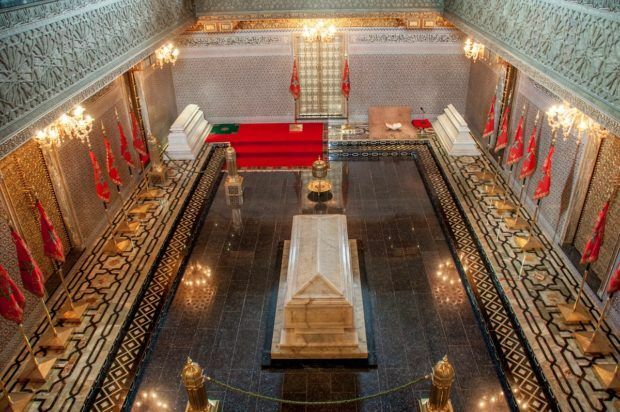 Our next stop was the Mausoleum of Mohammed V, which contains the tombs of the King and his late sons King Hassan II and Prince Abdallah. The huge marble building topped with a green tiled roof has mosaics and a gold leaf ceiling, leaving no doubt about its importance to the Moroccan people. The royal guards on horseback at the entrance and around the building are also quite a sight in their traditional red uniform. Before heading for a much-needed nap (jet lag hits us hard), we visited the Chellah. There’s no succinct way to talk about this site that has served numerous purposes over the centuries. It was first settled by the Phoenicians and then taken over by the Romans in the 1st century AD. In the 14th century, a necropolis was built on top of the Roman site, and the wall and massive main gate were added. Visitors can see different pieces of the cultures that have occupied the site—the fragments of the Roman city, remains of the Islamic complex, and the ruined tomb of Abu Al Hasan and his wife, which still has traces of scrollwork and mosaics. Although what is left around the site is minimal, it gives a clear indication of all the peoples that have called Morocco home over the millennia. The whole reason for our journey north was to visit Chefchaouen. The spectacular blue city was one of the things that enticed us to come to Morocco in the first place, so we weren’t going to let the fact that it’s a little difficult to reach deter us. Chefchaouen is a dream. Located in the dramatic Rif mountains, the town was largely closed off from the world beginning in the 15th century, which contributes to the feeling that it’s from another time. Its crooked passageways and hillside medina create a labyrinth to lose yourself in, literally and figuratively. 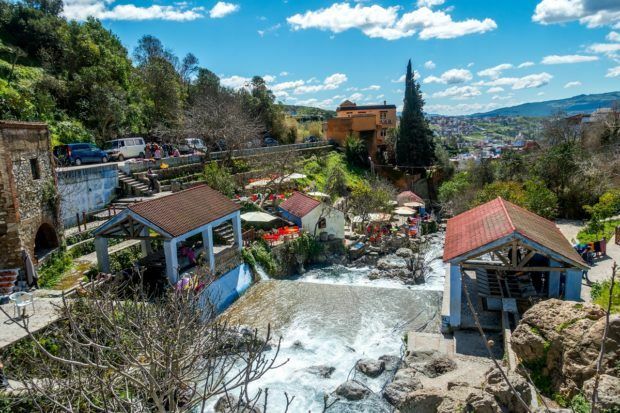 There is a handful of things to do in Chefchaouen. 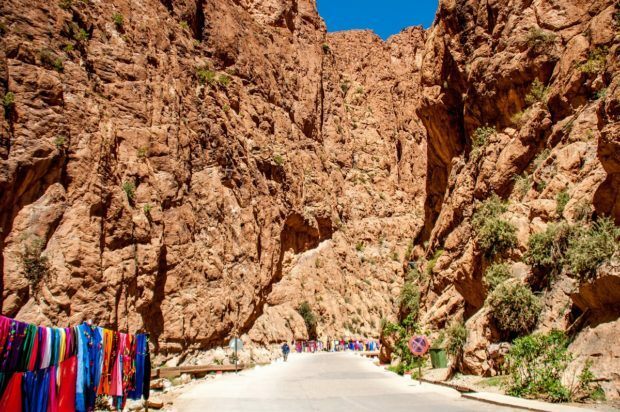 Visitors can stroll along the waterfall on the edge of town, hike in the mountains, or visit the Kasbah museum. 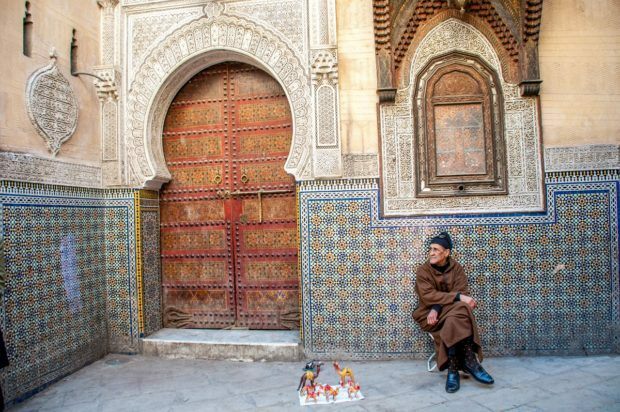 There are plenty of crafts and souvenirs to haggle over in the medina, and the vendors are always eager to engage. On Monday, Thursday, and Saturday, the local market fills with colorful produce and lots of activity by the locals. 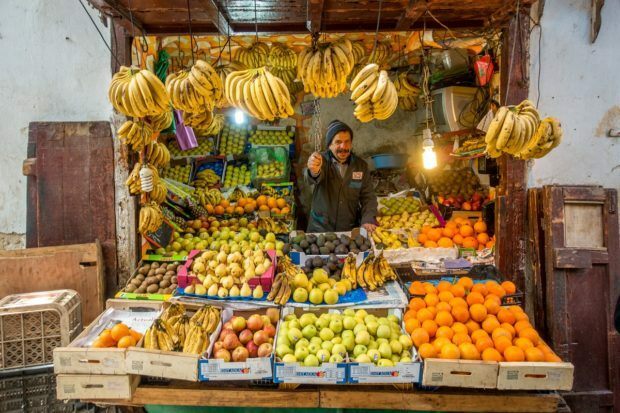 We loved wandering among the oranges and beans, watching an authentic slice of Moroccan life. If all else fails, a hammam is always a good idea. 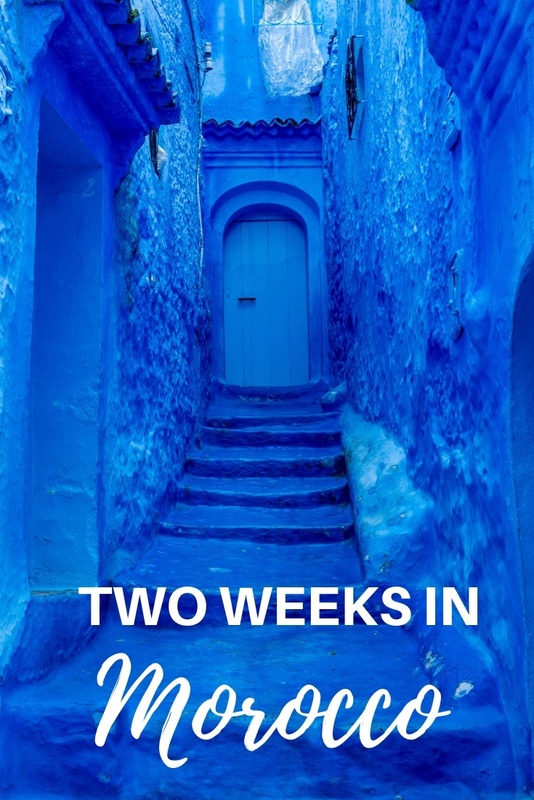 Our favorite thing in Chefchaouen was just being—something we often don’t take enough time to do on our trips, so we were glad we had two nights dedicated to staying in the colorful town. The homes, alleys, and stairs are all painted in shades of royal blue and cobalt, and there are unique designs, murals, and tiles all across the town. Every time you turn a corner, there’s a new surprise. It was a luxury to take it all in. The extra time allowed us to chat with locals and really explore without the pressure of an agenda. We walked the same paths and passages over and over, looking for our favorite spots, and we tried all the cheap, fresh orange juice we could get our hands on. We even found a restaurant we loved and went back twice. It was perfect. The next day brought a 3.5-hour trip south to Fez with a couple of stops along the way. First up were the ancient ruins of Volubilis, some of the oldest things to see in Morocco. This site—a bit off the main road and thousands of years back in time—confirmed our long-held belief: there’s just something about a mosaic. A colorful, intricate decoration still in the same spot it was laid centuries ago will leave me wide-eyed every single time. 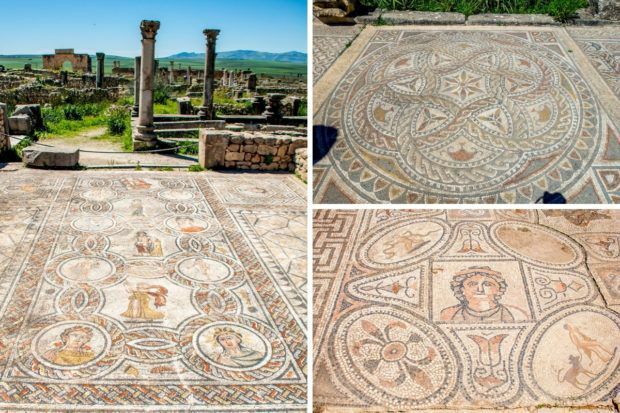 From Butrint in Albania to Ostia Antica in Italy, we’ve seen some magnificent ones, but not as many or as well-preserved as at Volubilis in the Moroccan countryside. 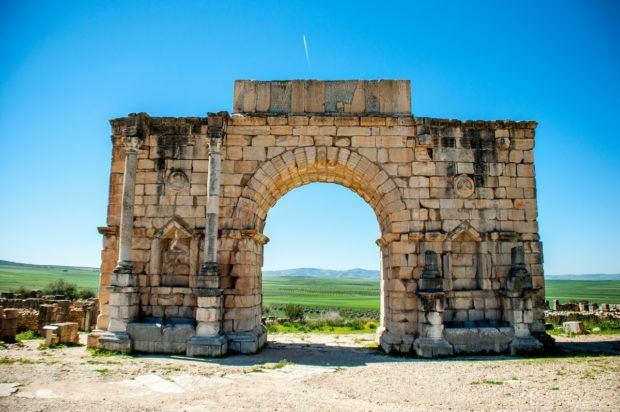 A settlement since the 3rd century BC, Volubilis was occupied by the Phoenicians and Carthaginians, but it was under the Romans that the city really flourished during the 1st century AD. Thanks to wealth from its olive groves, local merchants has lots of excess funds to spend decorating their homes with things like mosaics. The number of the beautiful works in situ led to Volubilis being named a UNESCO World Heritage site in 1997. In the spring, wildflowers bloom among the ruins and the surrounding bright green fields. There’s no respite from the sun, so wear sunscreen and bring water if you’re traveling in the warmer months. After Volubilis, we pushed on to Meknes for lunch and a quick look around. 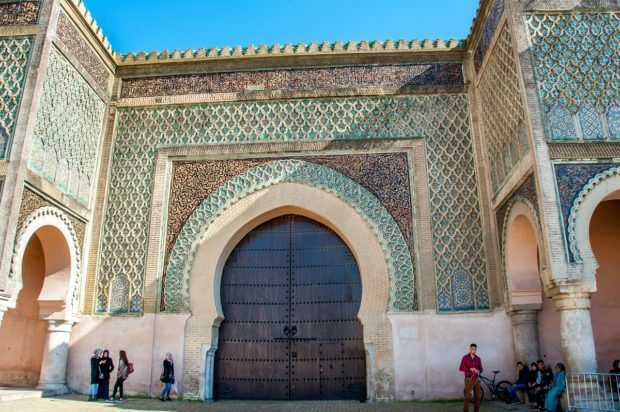 One of the four imperial cities in Morocco, Meknes is probably most recognized for its enormous gate, Bab Mansour, that has marked the entrance to the city for nearly 300 years. 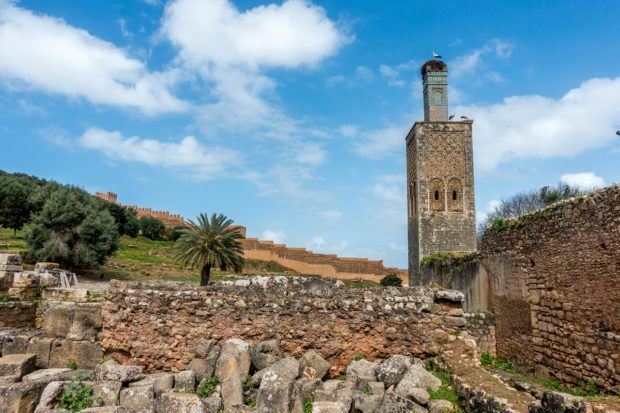 Compared to other big cities to visit in Morocco, Meknes is laid back, but it has everything you would expect, including a well-preserved 9th-century medina with a bustling square called Place el-Hedim. You can shop for everything from textiles and leather to tennis shoes and household goods. 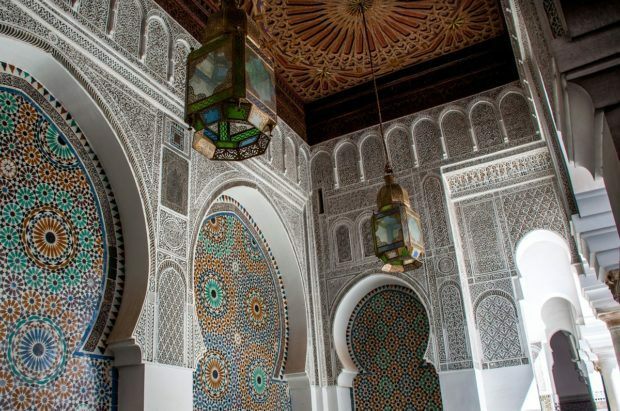 For opulent mosaics and tile work, head to the Mausoleum of Moulay Idriss (the founder of Meknes), visit the 14th century Islamic school, or grab a mint tea and people watch. By the time we checked into our riad in Fez, it was dinner time. For me, Fez was all about the tanneries. Years ago, I saw a photo of these colorful circles—not knowing where they were or even what they were—and was determined that I needed to see them in person one day. 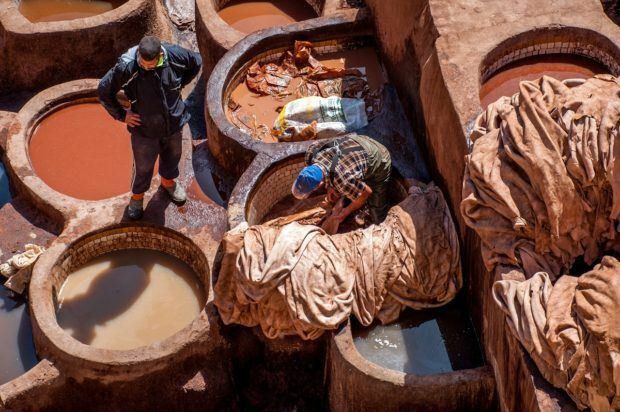 Lucky for me, the Chouara Tannery was one of our first stops in Fez. Every day, the tannery workers fill the giant vats with different colored dyes as well as a variety of unsavory substances like urine and pigeon poo mixed with water that are used to strip and prepare the hides. 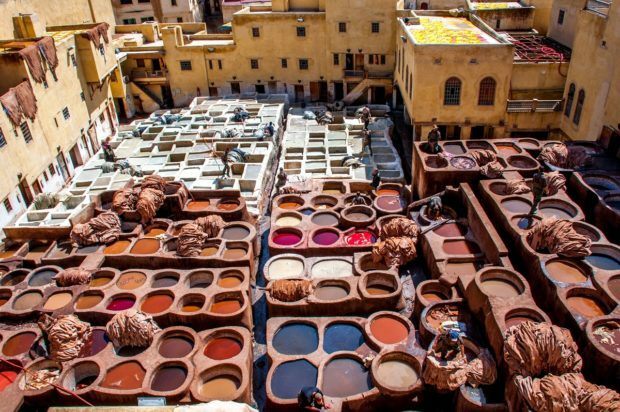 They walk back and forth rotating, submerging, and dyeing their products to be used for the leather goods Fez is so famous for. The result of all the work is a giant grid of color when seen from above. The best vantage points come from the shops that surround the tannery so you can see all the work going on at once. In the warmer months, the smell can be quite fierce, so guides and shop owners provide mint springs to guests to dull the odor. 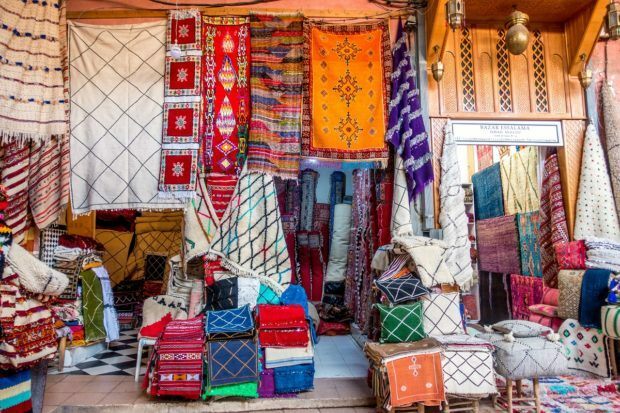 You don’t have to buy anything in the shops in order to get the good view, but they are some of the best places in Morocco for buying leather, if you’re in the market for something. After the tannery, we had a long list of other sites to visit in Fez. 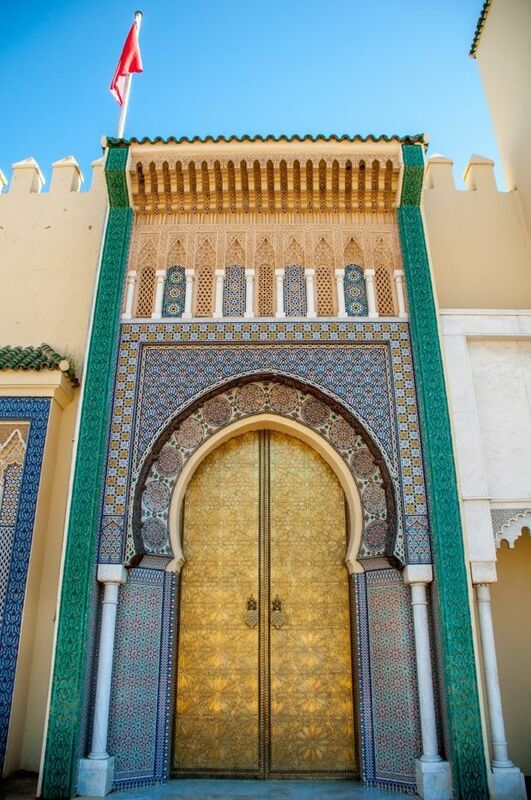 We stopped by the gleaming gates of The Royal Palace, one of the main attractions in Fez. After admiring the gates, we walked just a few minutes away through the mellah, the historically Jewish quarter. The mellah, which was once home to thousands of Jews, is characterized by multi-story buildings and elaborate open balconies. 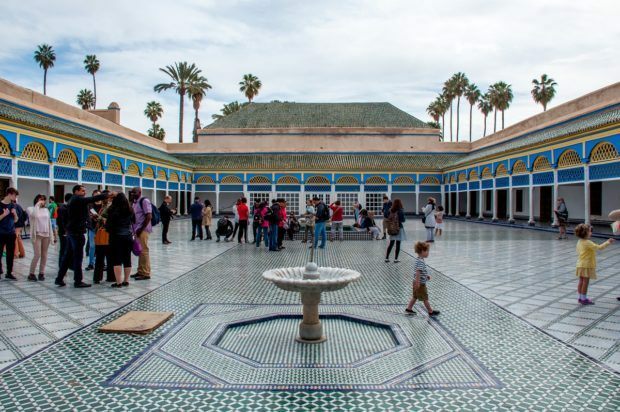 There are also several restored synagogues, a Jewish cemetery, and a museum cataloging the items Jews left behind when they left Morocco for a series of reasons ranging from the founding of Israel to Morocco’s tendency to side with its Arab cousins in times of conflict. A visit here is a fascinating look at the unique history of a people who have lived in Morocco since the 6th century BC. 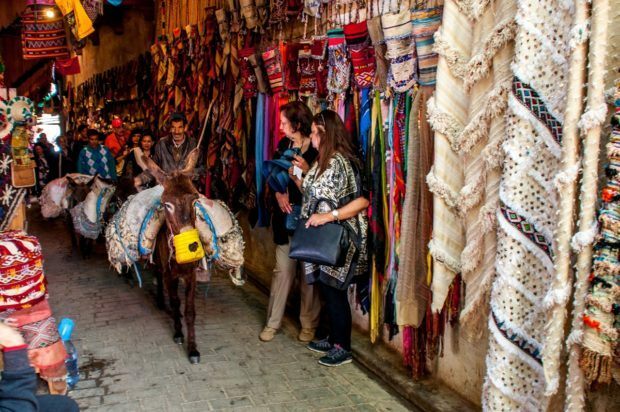 There are lots of opportunities for shopping in Morocco, and visits to several workshops were on our itinerary for the day. 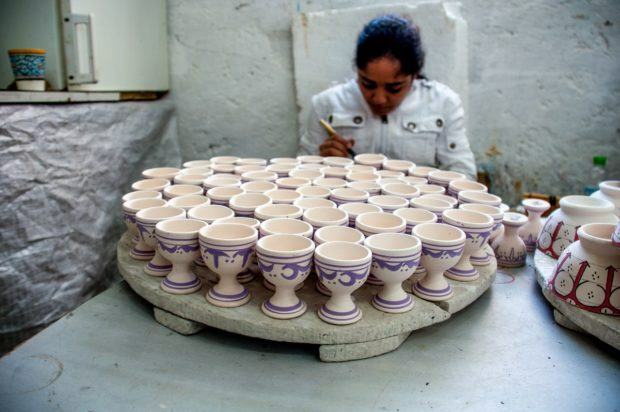 We saw handmade pottery coming to life in kilns in front of us and watched as craftsmen painstakingly made mosaic pieces. We listened to the constant sweeping noises of the huge looms making carpets and even got a lesson in all the ways to wear a handmade Moroccan scarf. Sometimes these presentations come with a heavy sales push, but we were fortunate to avoid that. Back in the medina—one of the most popular Morocco attractions—we wandered all the souks, soaking up the atmosphere of the busy passageways and small squares and getting thoroughly lost in the activity. There’s really no way to avoid getting a bit turned around, and finding your way out is fun anyway. We saw an endless number of multi-colored lanterns, stacks and stacks of rugs for sale, and metalworkers shaping copper pots. Plenty of the shops in the souks are designed for tourists, but there are many more—like the professional knife sharpener—that are for locals. One of our favorite souks was for weddings-related items. There was the expected jewelry and elaborate dresses along with some decorations. But one thing we didn’t anticipate was the traditional roofed carriage called an amaria. Brides ride in on them carried by a group of 4-6 men. It’s like something you might imagine happening for Cleopatra. There are also several historical sites in the 9th century medina that have helped Fez land a spot on the UNESCO World Heritage list. Foremost among them is the University of Al Quaraouiyine. Founded in 859, it is considered the world’s oldest university. It is one of the top spiritual and educational institutions of the historic Muslim world and still instructs men and women in a variety of subjects. The courtyard’s colorful tile work and carved arches make Al Quaraouiyine one of the prettiest sites in the medina. Madrasa al-Attarine is also a popular stop because of its unique architecture. 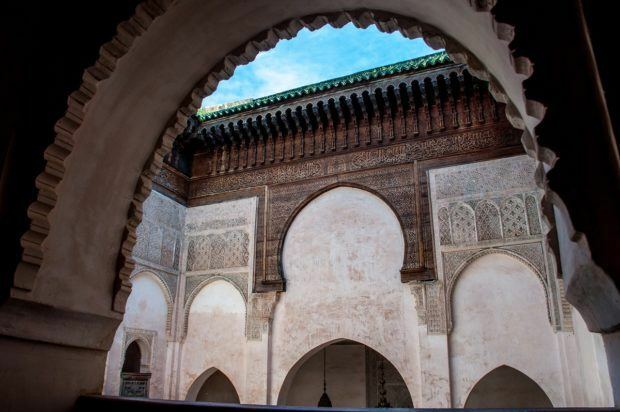 Built in the 1320s, the madrasa was a center of religious learning in the medina. It is now known for its beauty with Arabic calligraphy and geometric mosaics on the walls and floors. 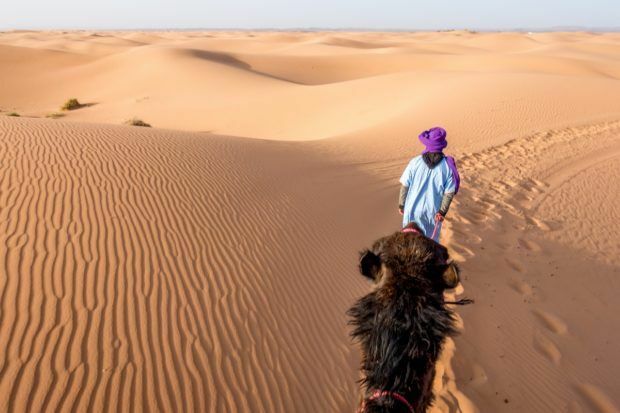 The midpoint of our Morocco itinerary was just about getting from one place to the next—making the 8-hour trip from Fez south to Merzouga, the entry point for Erg Chebbi and the Sahara. We stopped a few times along the way simply to break up the drive. 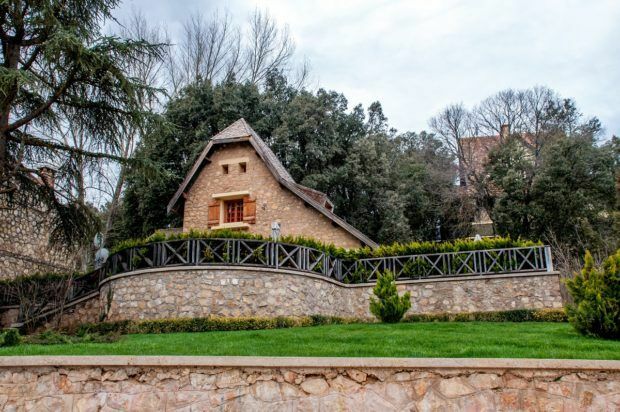 The first stop was Ifrane, a city about an hour outside of Fez. In the Middle Atlas 5460 feet above sea level, the city has a Swiss alpine feel to it. The weather is cooler, houses have flower beds and red roofs, and there are parks and lakes. In the winter, it’s a ski resort so you really feel like you’ve been transported to Europe. Ifrane was quite a contrast to both where we had left—the hectic city of Fez—to the where we were going—the ruddy desert dunes. After a brief break in Ifrane, we made a quick pit stop in Azrou, which is known for its population of Barbary macaques. 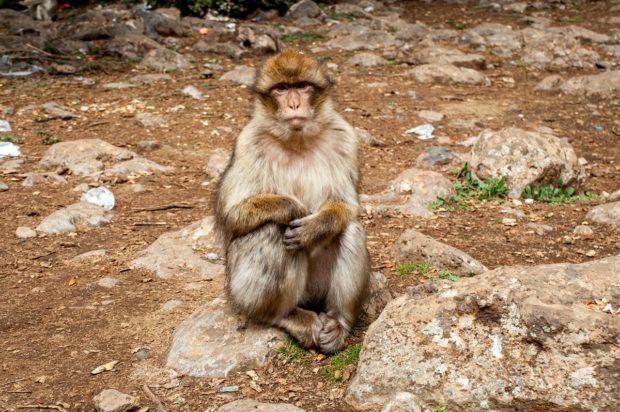 We had seen these wily monkeys on a trip to Gibraltar so we were prepared for just how much they like to interact with humans…mostly to steal food. It’s possible to get close to them, but don’t feed them and guard your items closely because they are known for taking things. From Azrou, we had a long day of driving and watching the landscape change. We drove through the mountains, past oases, and ultimately out to the desert. 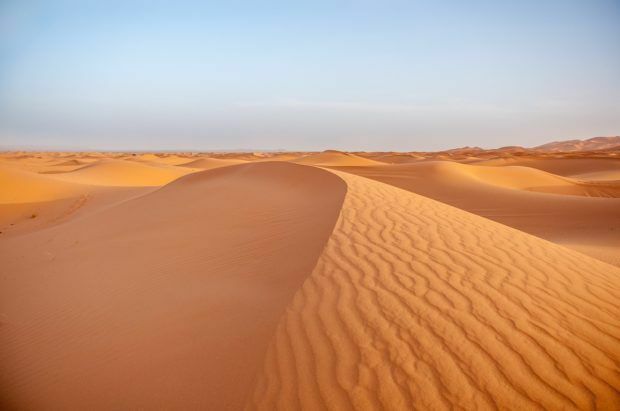 Located in the Sahara in southeastern Morocco, Merzouga is the gateway to Erg Chebbi, the point where many visitors enter the Morocco desert. 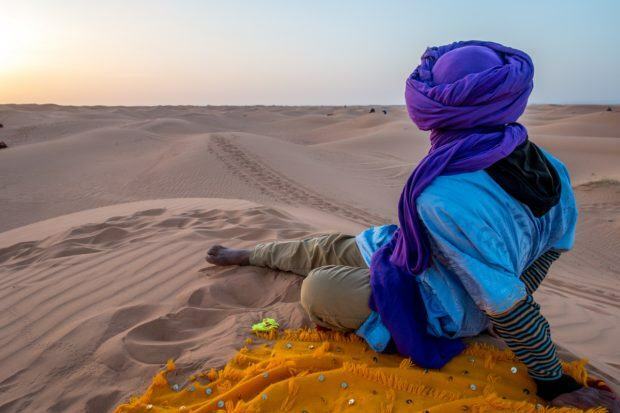 Because the camel caravans typically leave for the sand dunes near sunset, most people will have at least a portion of the day in Merzouga. We started the day off with a visit to a nearby village that included a performance by Gnawa musicians. 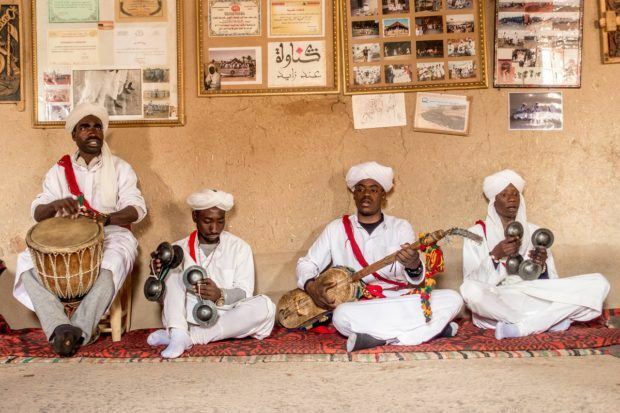 The Gnawa are an ethnic group originally from West Africa who play a style of music based on African Islamic spiritual songs and rhythms. The performance involved lots of drums and hypnotic beats with call-and-response lyrics. There are many different musical traditions throughout Morocco, so it was interesting to see this one in the desert. After the performance, we drove around the area to see the remains of traditional homes that had been constructed in the sand (and are now being reclaimed by the dunes). We had one of our best meals in Morocco among the dunes and then headed to a farm created in the middle of the desert. 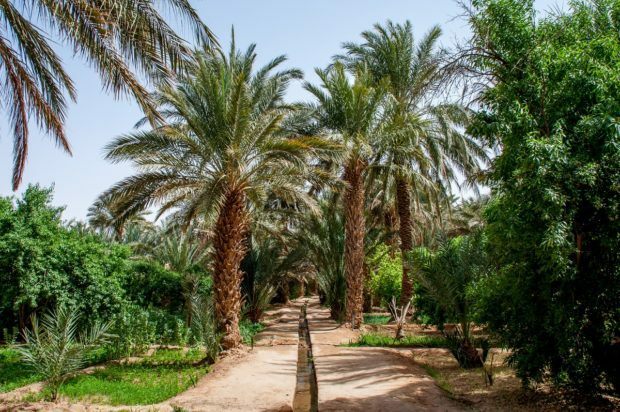 We learned about the irrigation techniques used for growing food in the Sahara and wandered among the many trees that don’t seem like they should be able to grow in a place that gets only three inches of rain per year. By late afternoon, we were ready to climb on our camels and head out to the desert. 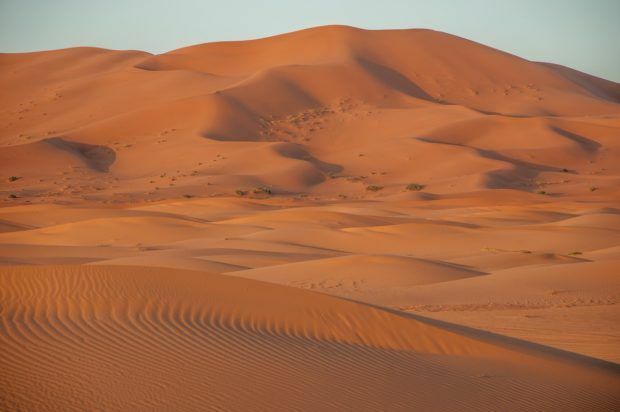 Our caravan of three—our guide, Lance, and me—plodded through the golds and oranges of the undulating sand dunes, watching the waves of sand twist and turn along our path. Within about a half-hour, we claimed a spot on top of a ridge to watch the sunset and lingered for awhile. We arrived at our desert camp right after dark and quickly explored this hotel in the sand that was a completely new experience for us. With full showers, plumbing, and fabulously comfortable beds, there was almost nothing that felt like a camp other than the canvas walls. After dinner and another musical performance, it was bedtime because—for once in our lives—we were determined to be early risers. There are very few things we get up early for in the morning, but sunrise in the desert is one of them. One of the most remarkable things about the desert is that the sand dunes, which are waves, also have small waves in them, so the colors and shadows change with every movement of the sun across the sky. We busied ourselves for nearly an hour just watching the light play on the sand before we realized it was time for breakfast. There are options for things to do in the desert during the day like surfing on the dunes or going four-wheeling, but it was time for us to leave by mid-morning, so we had to content ourselves with the sandy views. We had another six-hour drive ahead of us. Like the drive out to the desert, the journey back east to Ouarzazate was long stretches of open road. But we did have the chance to stop for awhile in the Todra Gorge and Dades Valley. In the High Atlas, the Todra and Dades Rivers carve out deep red canyons for 25 miles. What they leave behind are dramatic views of towering cliffs and lots of opportunities for rock climbing, wading in the water, and otherwise enjoying the outdoors. Despite the area’s remoteness, it’s one of the more popular places in Morocco for hiking. By late afternoon, we were ready to settle into our hotel in Ouarzazate. 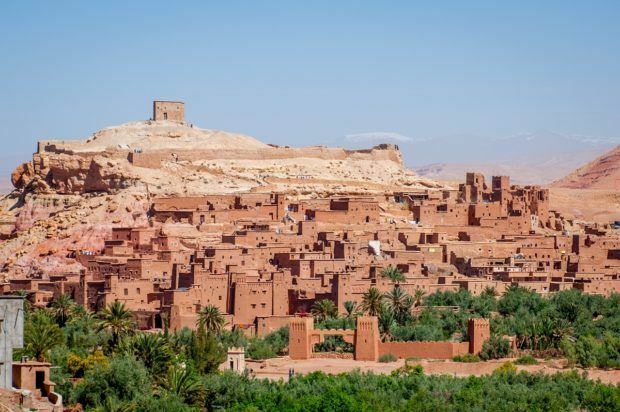 Close to the desert, the mountains, and an oasis, the city of Ouarzazate can double for just about any setting in North Africa, the Middle East, or an author’s fantasy world. That’s why it’s been used as the backdrop for everything from Game of Thrones to Gladiator and Lawrence of Arabia. In fact, this city that is likely not on the radar for most travelers, is home to the world’s largest movie studio by acreage, and you can walk among the sets for many of its productions. The reason we chose Ouarzazate, though, was for its UNESCO World Heritage Site, Ait Benhaddou. 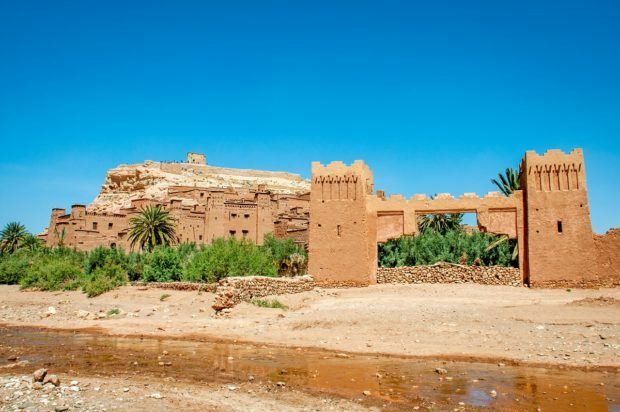 The ksar (fortified village) was once an important stop on the former trading route between Marrakesh and the Sahara. Today, it’s a beautiful example of Southern Morocco architecture—earthen buildings surrounded by high walls. From far away, the structure hardly looks real. It nearly blends into the ground around it, except for the pillars and relief carvings. Up close, we got an appreciation for the fragility of the construction, much of which has been rebuilt several times since its inception in the 17th century. Only a handful of families still live in Ait Benhaddou, but there are several shops, and a hike up provides great views (although we didn’t find going all the way to the top overly impressive). With more time, we would have loved to stop and have tea at one of the cafes. A four-hour drive had us in magical Marrakech by dinner. Marrakech is one of the best cities to visit in Morocco. Whether your trip is 5 days or 15, Marrakech should be at the top of your itinerary. 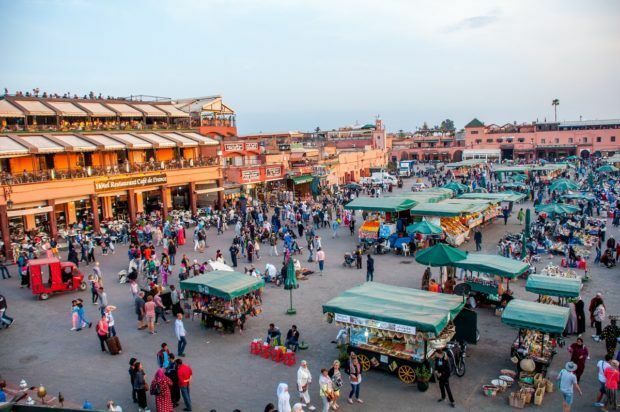 Many of the things to do in Marrakech center around the medina and its enormous square, Jemaa el Fna. During the day, you’ll find juice stands and a handful of roaming vendors selling everything from jewelry to henna applications plus lots of people milling around and making their way from one place to the next. At night, the square buzzes with bright lights and grills as dozens of open-air restaurants take over for the evening, accompanied by even more people selling all kinds of goods, playing music, and spinning tales. It’s quite something to see, and the square has been recognized by UNESCO for its unique, historical environment. The activity continues inside the souks, which are also a highlight when you visit Marrakech. We wandered our way through the amazing colors of the dyers’ souk and to the spice souk, which is sounded by modern cafes. As in Fez, we were taken in by the patterns of the carpets, the smells of the amazing food stalls, and the endless number of shoes and lanterns in all the rainbow-hued glory. There were stacks of olives as tall as a toddler, an enormous supply of every leather good you can imagine, plus silver, tea, and any other thing you could want. The souks of Marrakesh wind for miles in a dizzying pattern of back alleys, dark doorways, and sun-speckled courtyards. There’s so much to see that you’re bound to miss most of it. Our guide showed us as much as our feet could stand on the first day, and we went back to explore more in the second day. 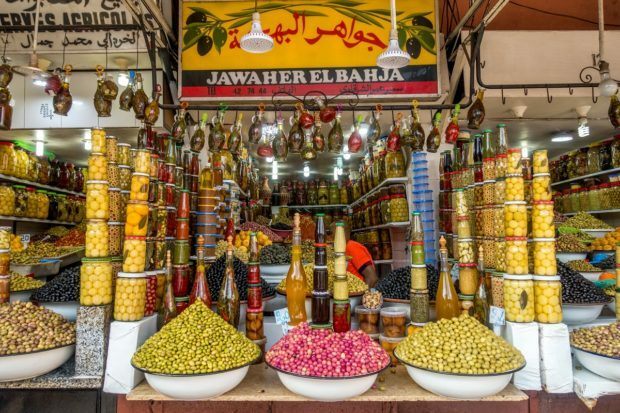 We also made one of the best decisions of our trip by opting for a food tour with Marrakesh Food Tours, a company run by an American blogger and her Moroccan husband. Together, they showed us parts of the medina and food specialties like Marrakechi tangia and homemade couscous that we never could have found without their help. Two other popular things to see in Marrakech are the Saadian Tombs and the Koutoubia Mosque. The Saadian Tombs date from the late 1500s and are the resting place for 66 princes and prominent figures as well as about 100 other servants to sultan Ahmad al-Mansur and his family. The intricately decorated marble mausoleum is the main site, which was hidden along with the other graves for about three centuries. 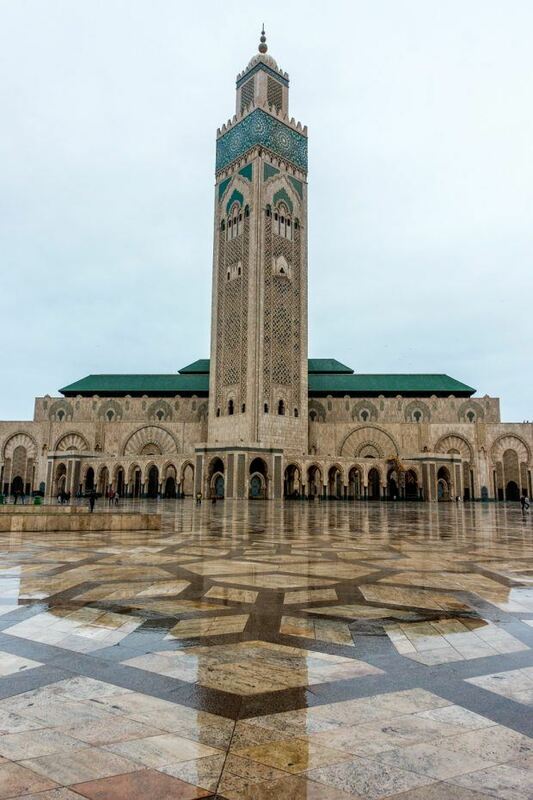 The Koutoubia Mosque, which dates from the 1100s is the largest mosque in Morocco. Although non-Muslims can’t go inside the red stone building, you can visit the gardens and admire it from the outside. In the new city, you’ll find the most popular attraction in Morocco, the Jardin Majorelle. 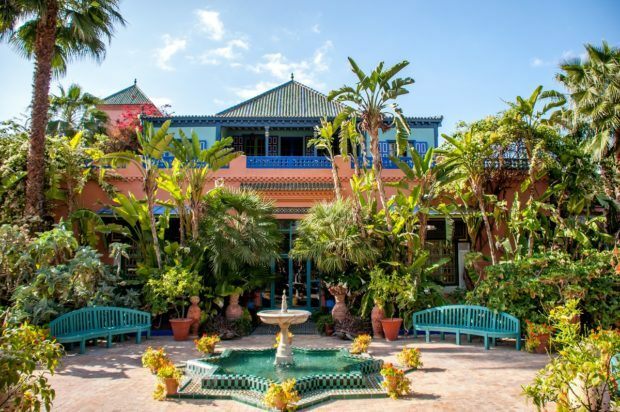 French Orientalist artist Jacques Majorelle built the garden complex over 40 years beginning in 1923, and it was revived in the 1980s after being purchased by fashion designer Yves Saint Laurent and Pierre Bergé. With hundreds of plants and trees from all over the world, visitors can admire the flowers, fountains, and cobalt blue buildings of the garden. During our visit, Saint Laurent’s private garden was open to visitors, which is a rare occurrence, and made the wait to get in worthwhile. 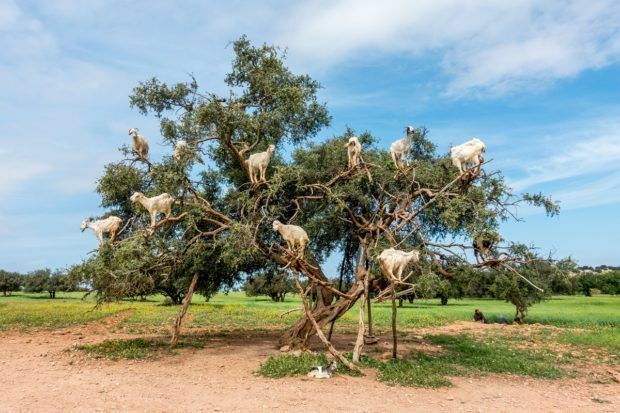 There are lots of unusual things to see in Morocco, but one of the most unexpected must be goats in trees. Our last day in Morocco included a day trip from Marrakech to Essaouira on the coast, and we encountered this unusual sight on the side of the road along the way. Historically, the goats climbed into the argan trees and ate the tough seeds that hang from the branches. Their “processing” of the seeds helped the farmers to extract the valuable contents inside the seeds. Today, machinery processes them more efficiently, so the snacking goats in trees are just for tourists, but it makes for an interesting stop on the 2.5-hour drive to Essaouira. After another brief stop at a women’s cooperative where we tried the argan oil, we reached Essaouira. This lovely seaside city has a busy harbor with an active fishery and is a popular destination for windsurfing. Every day, fishermen line the harbor with their catch and deliver fresh fish to the restaurant kiosks near the water. If you’ve had your fill of chicken tagine elsewhere in Morocco, Essaouira is the perfect place to try some seafood. 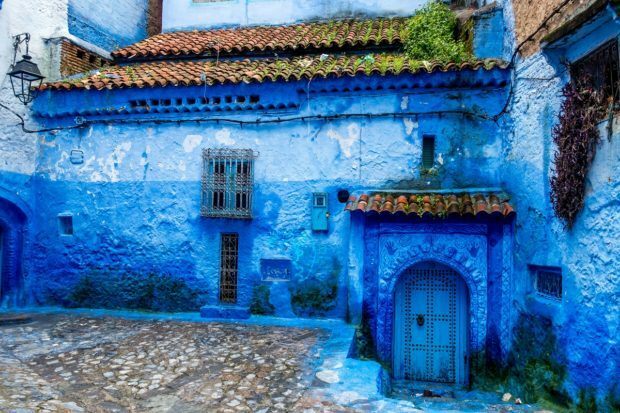 The white-washed homes and businesses have blue shutters that look more like they belong in Santorini than Morocco, but the medina has looked this way for centuries. 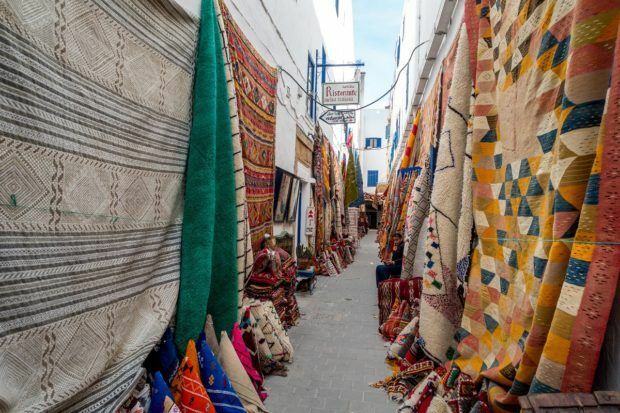 Inside the winding alleys of Essaouira’s medina, you’ll find craftspeople carving cabinets, numerous art galleries, and all manner of shops and restaurants. Many cafes have rooftop views that let you enjoy the sun and sea breeze. After all the activity the last two weeks, it’s nice to have a spot to sit and relax and watch the waves crash. There are a few important considerations beyond which cities you choose to visit in Morocco. 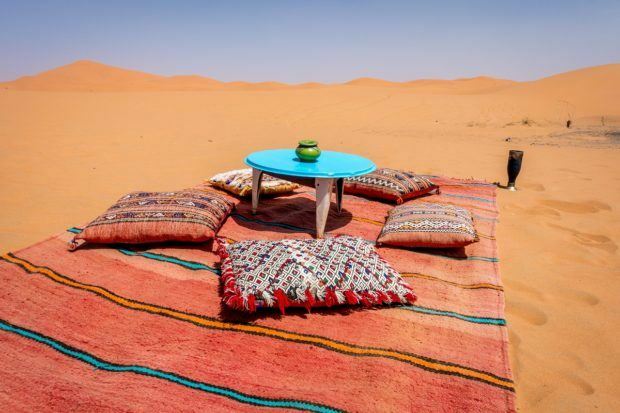 When to go — For most people, the shoulder season will be the best time to visit Morocco. That means going in April and May or September to November. During these months, the weather is generally good (not too hot or too cold), and there are fewer tourists than you’ll find during summer and winter holiday breaks, although Easter week is an exception. Avoid going to Morocco during Ramadan because many things will be closed. What to plan around — Fridays are holy days, which means that many shops in the medina will be closed. While large tourist attractions are usually open, the rest of the city can appear a bit dead. We structured our itinerary specifically to avoid being in Fez or Marrakech on Friday because the medinas are such hubs of activity there. How to stay connected — Cell coverage is generally good in the cities but can be very spotty in remote areas. We know people who have racked up significant roaming charges just doing simple things like looking up maps or trying to translate between languages. We opted to rent a wifi hotspot which came in extremely handy, especially on the longer road trips. We wrote in more depth about our experience using a hotspot in Morocco here.